“Many people must be wishing that the secret of atomic fission had never been discovered,” lamented the distinguished critic and philosopher Joseph Wood Krutch, “but we are saddled with the atom bomb, and it looks as though we would have to live — or die — with it.” Such existential problems are the subject of The Butter Battle Book (public library), a controversial arms race allegory by Dr. Seuss published in 1984. 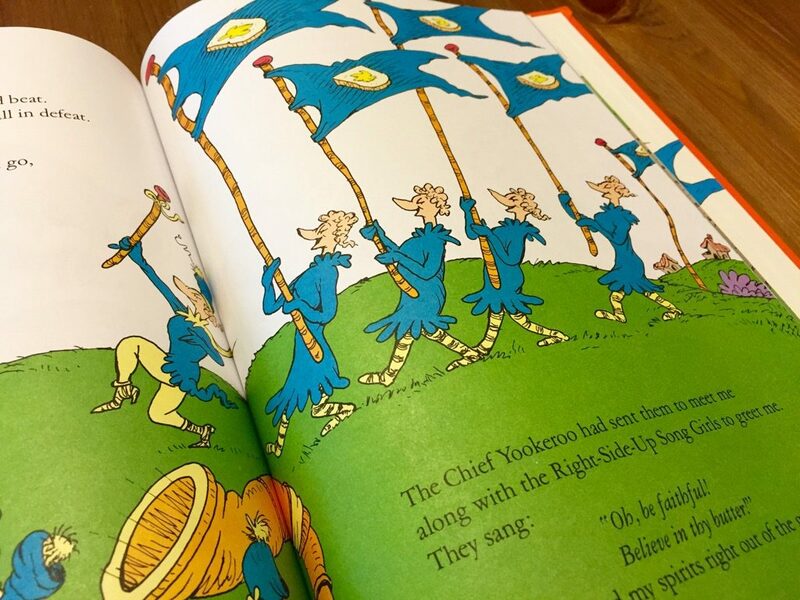 Full of the famous author’s trademark artwork and whimsical rhymes, the book also contains a stinging satire on nationalism, militarism, and the escalation of violence. It starts innocently enough. 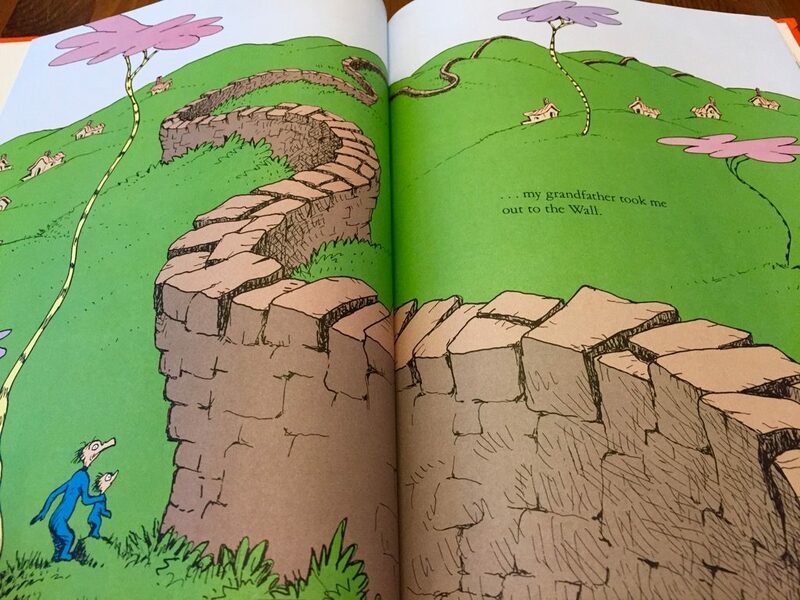 A grandfather takes his grandson for a walk alongside an enormous wall that separates two people. The difference between the groups? Yooks eat their bread with the butter on top — Zooks with the butter on the bottom. The culinary preference is the only discernible difference between the two groups, save for the color of their clothing. But what appears to readers to be a subtle distinction is not insignificant to the characters in the story. 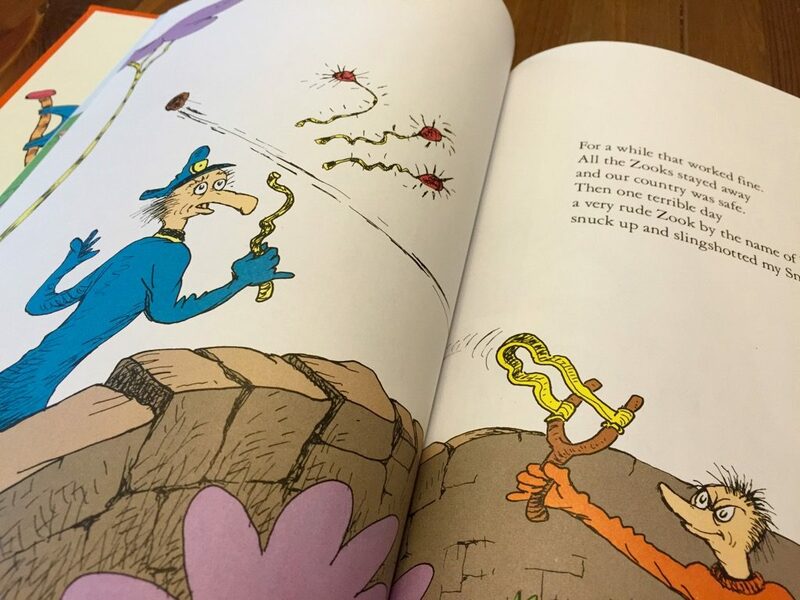 The story consists of several high profile confrontations between Grandpa — a “watcher” who patrols the border looking for Zooks — and his Zook counterpart, VanItch. 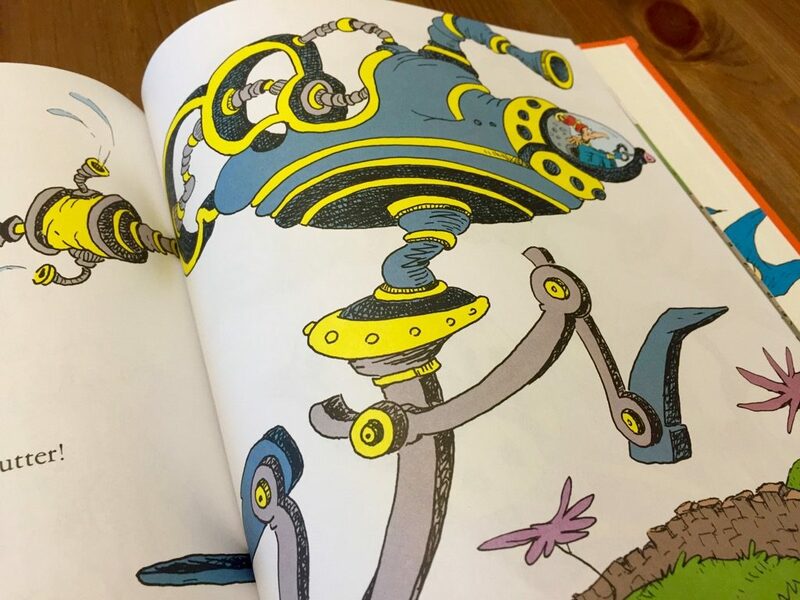 With every confrontation, the other side escalates the standoff by brandishing a new and increasingly destructive weapon — the Snick-Berry Switch, Triple-Sling Jigger, and Utterly Sputter. Finally the “boys in the back room” develop the Bitsy Big-Boy Boomeroo, a handheld weapon capable of destroying all Zooks. It’s an obvious reference to nuclear weapons. After all Yooks have safely evacuated to an underground bunker, Grandpa heads for the wall and prepares to drop the Big-Boy Boomeroo. There’s only one problem: VanItch has the weapon too. Is the book still relevant in a post-Cold War era? One reviewer recently called it “a little simplistic, a little out-of-date, even a little out-of-keeping.” But if history and current events are any indication, The Butter Battle Book is more relevant now than ever before. “The likelihood of a nuclear catastrophe is greater today than during the Cold War,” former defense secretary William Perry recently warned reporters. 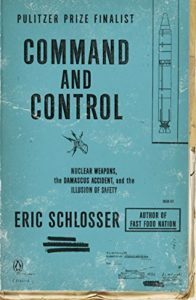 Eric Schlosser, the award-winning author of Command and Control, agrees. “This is the scary thing for me,” Schlosser said in an interview. “The people for whom this is still a threat, the people who are most anti-nuclear, the people who are most afraid about this, are the ones who know most about it.” Schlosser himself should know. In his harrowing 658-page book, he examines the history of the United States’ efforts to control its nuclear weapons. Spoiler alert: the nation has barely succeeded in preventing accidental nuclear detonations on its own soil. The fall of the Berlin Wall now feels like ancient history. An entire generation has been raised without experiencing the dread and anxiety of the Cold War, a conflict that lasted almost half a century and threatened to annihilate mankind. It was ordinary men and women, not just diplomats and statesmen, who helped to avert a nuclear holocaust. Their courage and their sacrifices should be remembered. Although most of the events in this book occurred a long time, they remain unfortunately relevant. Thousands of nuclear warheads still sit atop missiles belonging to the United States and Russia, ready to be launched at a moment’s notice. Hundreds more are possessed by India, China, Pakistan, Israel, North Korea, Great Britain, and France. As of this writing, a nuclear weapon has not destroyed a city since August 1945. But there is no guarantee that such good luck will last. That shortsighted solutions can leave a lasting legacy is one of the lessons central to The Butter Battle Book. 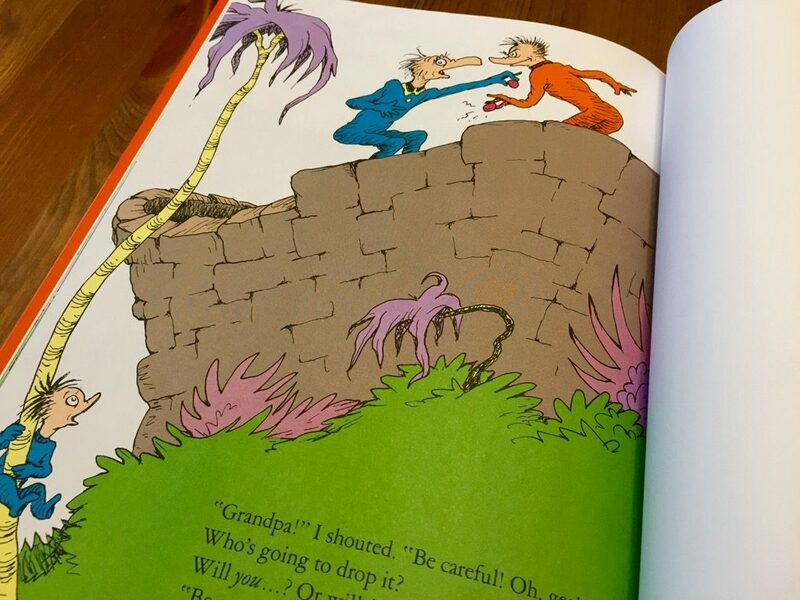 Dr. Seuss effectively describes a system in which one nation’s apocalyptic threats are countered by the other nation’s invention of even greater weapons of mass destruction. Collectively the events form a perpetual and potentially catastrophic cycle of escalation, threats, and violence. 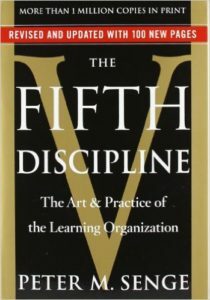 MIT professor Peter Senge described this phenomenon, which he refers to as the “escalation system archetype,” in his classic book on systems thinking entitled The Fifth Discipline. Two people or organizations each see their welfare as depending on a relative advantage over the other. Whenever one side gets ahead, the other is more threatened, leading it to act more aggressively to reestablish its advantage, which threatens the first, increasing its aggressiveness, and so on. Often each side sees its own aggressive behavior as a defensive response to the other’s aggression; but each side acting ‘in defense’ results in a buildup that goes far beyond either side’s desires. According to Senge, individuals who fail to recognize or acknowledge systems like this one are “bound by invisible fabrics of interrelated actions, which often take years to fully play out their effects on each other.” He says this is common in nations where people are not taught the art of systems thinking. In fact, Senge argues that most children are taught just the opposite — how to break apart problems, instead of how to connect the dots and see related issues as part of a bigger picture. From a very early age, we are taught to break apart problems, to fragment the world. This apparently makes complex tasks and subjects more manageable, but we pay a hidden, enormous price. We can no longer see the consequences of our actions; we lose our intrinsic sense of connection to a larger whole. When we then try to ‘see the big picture,’ we try to reassemble the fragments in our minds, to list and organize all the pieces. But, as physicist David Bohm says, the task is futile — similar to trying to reassemble the fragments of a broken mirror to see a true reflection. Thus, after a while we give up trying to see the whole altogether. The good news is that systems thinking is a conceptual framework that can be taught. According to Senge, “experiments with young children show that they learn systems thinking very quickly.” That knowledge may in turn help future generations change existing systems, like the escalation system archetype characteristic of the arms race and the war on terror. 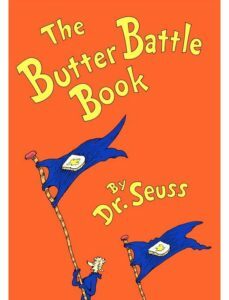 The Butter Battle Book has been banned from some libraries, probably because of its strong message and moral. But that makes the book all the more important. Albert Einstein once wrote in his tribute to Spanish cellist Pablo Casals that “the world will not be destroyed by those who do evil, but by those who watch them without doing anything.” Perhaps the world would do well to share this book with children. 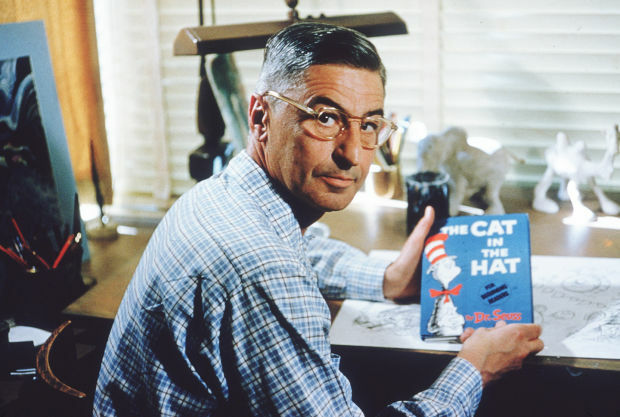 Complement it with other books by Dr. Seuss.